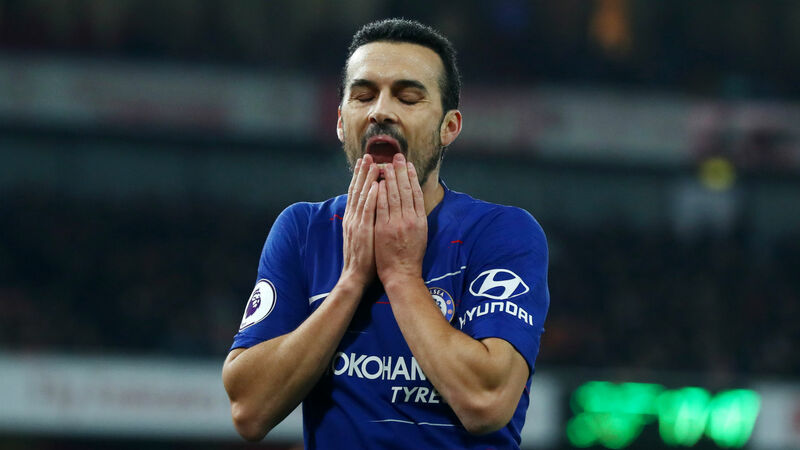 Pedro is adamant he and his Chelsea team-mates have not lost belief in coach Maurizio Sarri's philosophy following troubling recent results. Sarri's side were torn apart by the defending champions at the Etihad Stadium, and the coach accepted afterwards that his job could be at risk. "No, for the team it's clear, the idea of Maurizio," the Spaniard told reporters on Wednesday. "It's true that, in the last games, we've not been in a good condition for us, not focused. "It's difficult for us: when you play City, Tottenham, Arsenal or [Manchester] United, they're a good level in our league, but the most important thing now is to be focused and ready because this is an opportunity for us to do well in this [Europa League] competition. "All the team follows the idea of Maurizio: press really high, stay compact, and to create chances, with good possession, a lot of the ball. "We can do this as a team, but sometimes it's so difficult to play in this way. It depends upon the opponents. "City played very well, so it was so difficult to press, to create between the lines, and to defend, but it's Maurizio's idea, and I prefer to press high when we recover the ball to create chances, not to wait for 90 minutes to recover the ball and run 60 metres to score the goal. "It's difficult, the last week for us. It [the defeat to City] is probably the worst of the season, but the most important thing now is [Thursday's] game."